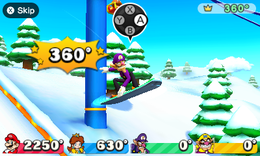 Snow Whirled is a 4-player minigame in Mario Party 6. It is also featured in the minigame compilation game, Mario Party: The Top 100. In Mario Party 6, the only changes between day and night are aesthetic. The lights on the ramp and ski lift are activated at night, and an aurora appears in the sky at night, while clouds appear during the day. The camera flies from the bottom of the slope to the top of the ramp, where the players, on snowboards, are standing. 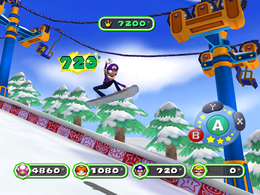 The minigame is based on the real-world sport of snowboarding. The object of the game is to get the most points by rotating 360º midair. The player starts by going down a slope. They must then perform as many 90º spins as possible while in midair by pressing , , , and in that order. The maximum possible score is 9720º (27 entire circles). This minigame appears as the fourth minigame in Decathalon Park. Here, the player's objective is to do as many spins as possible to earn as much points as possible, up to a maximum of 1,000. The default record for this minigame in Decathalon Park is 1080º. 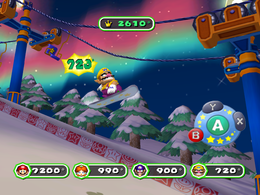 In Mario Party 6, the players stand in front of their snowboards, on the ground. The camera then zooms in on the winner as he or she does his or her victory animation. Rules – "Press the buttons in order to spin your snowboard in midair. Whoever pulls off the biggest spin wins!" Advice – "Press the buttons in order, but don't rush it!" Description – "Out-spin everyone else on your snowboard!" On-screen – "Do midair spins on your snowboard!" Mario Party 6 official art of Luigi playing Snow Whirled. The title is a pun on "Snow World" and "whirled". Snow World is an amusement park for winter activities such as snowboarding located in India. A similarly titled sport mini-game, Water Whirled, uses a like pun. This page was last edited on March 27, 2019, at 00:16.